OHSAS 18001 is the internationally recognised assessment specification for an occupational health and safety management system. The standard promotes a safe and healthy working environment by providing a framework that allows an organisation to consistently identify and control its health and safety risks, reduce the potential for accidents, aid legislative compliance and improve overall performance. 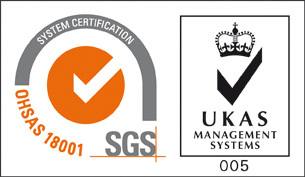 UK certified offices include: Warrington, Aberdeen, London, Crewe, Billingham, Whitehaven and Solihull. Australian certified offices include: Perth and Brisbane. North American certified offices include: Houston and Calgary.